Where do I use my Stand-Out.Net voucher code? Stand-out.net began online in 2005 and has continually grown and increased the number of designer labels they sell to over 60 of the very best. These labels include Diesel, Hunter, Emporio Armani, New Balance, Lacoste, Polo Ralph Lauren, Ray-Ban, Superdry, The North Face, Timberland, Tommy Hilfiger, Vivienne Westwood, Vans and many more. Shop for men’s clothing including hoodies and sweatshirts, jackets and coats, jeans, knitwear, polo shirts t-shirts, underwear and more and fill your wardrobe with both smart and casual men’s clothing that’s both high quality and affordable. Browse through the footwear section and find everything from boots, espadrilles and flip flops to casual trainers and smart shoes. As well as all this Stand-out.net also offer a men’s accessories section with bags, belts, scarves, gloves, snow goggles, sunglasses, wallets and much more, as well as a new in section and a ‘most popular brands’ page, so you can keep up with the latest trends and labels. If you’re shopping on a budget check out the regularly updated sale section that offers new discounted products every season. With up to 75% off all the categories at Stand-out.net, you’re bound to find a bargain piece from only the very best brands. There’s also a handy blog section available that features lookbooks, fashion favourites, a ‘how to wear’ section and much more fashion advice to help you look your best. Stand-out.net has a handy new in section available on their website which shows all the latest designer men’s clothing available from the very best brands in the industry. If you’re looking for the very latest pieces from the most popular names then the new in section is the place to look. And despite their new in status and popularity, these products don’t compromise on cost, remaining extremely affordable and value for money, making it easier to look well for less. If you’re trying to keep costs low then check out the sale at Stand-out.net. Here you’ll find great discounts on a number of stylish designer pieces including clothing, footwear and accessories. Shop by category, price, discount and brand to find the perfect fashion for all occasions. With up to 55% off all year round and even larger discounts available in the one-off end of season sales, you’re sure to find bargain pieces whenever you shop at Stand-out.net. Embrace Superdry's laidback philosophy and grab yourself a classic winter jacket and a hoodie to go with it. The Superdry brand continues to combine quirky Japanese graphics with vintage Americana to form a British take on a wide range of items. Its quality and detailing help to set it apart in the urban wear market while making it a favourite of celebrities and sporting stars alike. Superdry men’s clothing offers a wide range of different shapes and designs and gives you comfort and cool without compromising on style. Browse Stand-out.net’s extensive Superdry menswear collection to find t-shirts, hoodies, classic jackets and more. More information about international delivery. Please ensure you return your goods in original condition within 30 days of receipt. Or use the contact form on the Stand-out.net website. Stand-out.net aim to make you stand out from the crowd with their range of stylish designer men’s wear, without burning a hole in your pocket. 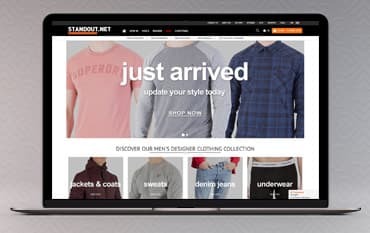 Stand-out.net are passionate about helping men of all ages find the right designer clothing for all occasions whether it be chilling out, hitting the town, attending dinner parties or simple day-to-day living. Their high street and premium fashion brands feature names like Levi's, Calvin Klein, Religion Clothing, Converse, Superdry, Lacoste, Hype, Tommy Hilfiger, Armani, Ellesse and many more. Shop with a Stand-Out.Net discount code from us and you could snap up bargain designer pieces for even less than you thought at Stand-out.net.